Beneath These Tarmac Cracks is a new play that questioned our idea of memory, shown as part of the Not Quite Light festival in Salford. A short piece of immersive theatre, it asked, what does it mean to remember, who has ownership over these memories, and if our past still causes us pain, should we bother to remember it at all? May, (Melissa Sinden), is the oldest resident in Daffodil Residential Home with a lot of stories to tell. Having developed a rare regenerative neurological disease, she can vividly remember every second of her life. She hence becomes a target of a keen young PHD student, (Ellie Scanlan), who wants to use May’s memories to write her research novel on feminist history. Greeted by a nurse ushering us in and telling us to watch our step was an immediate inclusion of the audience into the setting of the Nursing Home. 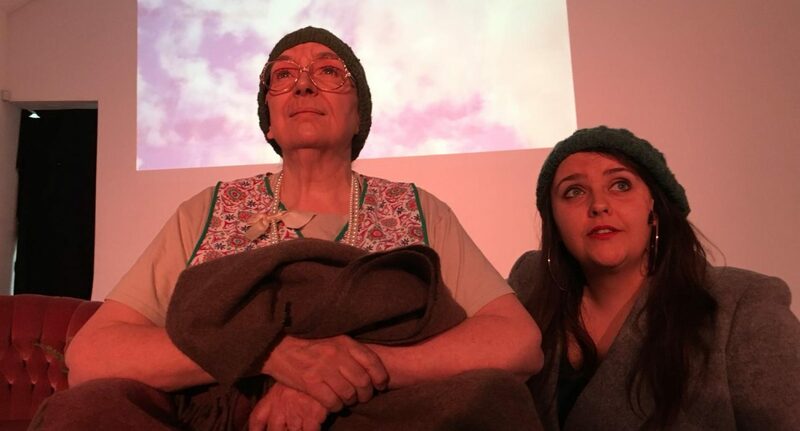 The set was simple, a bed and blankets and various memorabilia from a long-lived life, scattered amongst the regular images of the elderly such as medicine and a cannular drip. The almost stereotyped setting served as a symbol of the anonymity that comes with ageing in a society unable to associate the elderly with a current identity. Our initial inclusion into this setting linked the anonymity and voiceless nature of being an audience member with the anonymity of the elderly. An interesting decision, this effectively created a humorous and light-hearted beginning to the piece. However, I felt any deeper intentions were lost as this inclusive atmosphere quickly dissipated as the play continued. The show was well performed. Melissa Sinden played the character May with a stubborn, hot-headed temper and straight-talking attitude and likeability. Her moments of clarity and openness of emotion came through as refreshing breaks from this personality, rather than a sea of sentimentality. Ellie Scanlan lends the determined PHD student, Alice, candidly nicknamed “Wonderland”, a sort of wayward charm. Her absolute resolve to use May’s memories is constantly edged with desperation, which Scanlan allows to slowly bubble to the surface throughout the play. The script (Joshua Val Martin and Ellie Scanlan) was well-written, infused with natural witticisms and intelligently built the underlying tensions of age and motivations between the two characters. May both epitomises and contradicts images of old age. Her refusal to idealise the “Golden Age” and feelings of nostalgia from the past creates a conflict of interest between her and Alice. Past and present are created as equally tumultuous, equally painful and, ultimately equally important. May’s lucid flashes of memories, created through audio and visual effect, broke reality into an eerie, dreamlike experience on the stage. This technique is not used to scaremonger the audience but used rather wonderfully to inhibit the pain caused by memories, contradictory to the ideas of nostalgia Alice is hoping for May to reveal. Beneath These Tarmac Cracks was a touching illustration and warning of how ideas of the perfection of the past can cause pain in our present. A well done and beautifully performed piece, this story will stay with its audience long after the actresses left the stage.